This is not the story of a pet pony, an amusing tale of a Mr. Ed companion, or even the story of an amusing diversion for war-weary soldiers. This is the story of a highly decorated, twice-wounded, always faithful, brave Marine that served through gunfire, in darkness, and at great odds alone and most often at night. 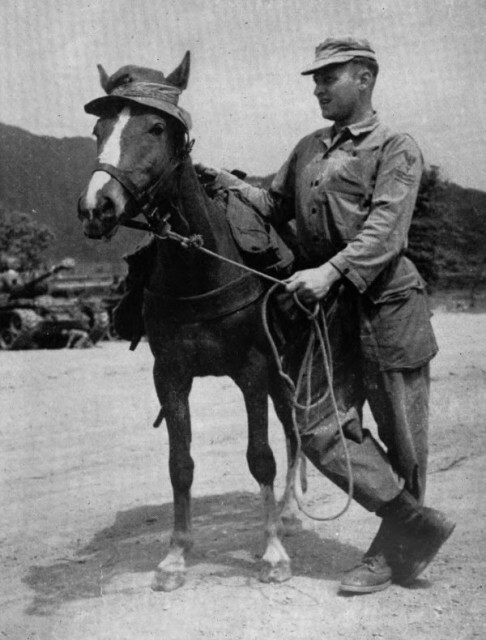 Sergeant Reckless was first known as “Flame of the Morning.” The red mare with white blaze was a racehorse in Seoul when a young Korean boy, Kim Huk Moon, saw her at the track and began dreaming in earnest of one day owning a horse just like her. He spent the next few years doing everything in his power to earn money to save for the purchase of a horse and he did so while being as near to Flame as he could. Beginning with scrounging for goods and coins dropped from the stands to his eventual acceptance as a groom for Flame and then moving up to apprentice, young Kim – with a determination not present in many eight-year-olds – eventually got his wish and became her owner. It wasn’t through luck or even his savings that Kim got his wish. It was through great adversity and trial. When Japan became involved in WWII, the horses of the racetrack were requisitioned for work in rice paddies. Kim’s superiors had gone off to fight and so he, along with the other grooms, went with the horses to work in the fields. He was devoted to Flame and trained her to work and cared for her as best he could. During all of this, he was disturbed by the treatment of American POWs in the camp in which he was working, especially that of Sergeant Bill Duffy of the Marines. Kim did all that he could to make Duffy’s life easier – on one occasion Kim was beaten to unconsciousness and left nearly blind in one eye. Flame bucked and screamed while her groom was beaten and for the days, he was out she wouldn’t let anyone harness her. When the war was over and the American soldiers released, Duffy asked the young boy what he would most like in the world. Of course, his answer was Flame, and so she was given. Kim and his beloved horse returned to the races. Sadly, over the next seven years, Kim Huk Moon lost family to death, including his mother and father. At the beginning of the Korean War, his remaining sister lost her leg in a land mine accident. They had no money, but Kim vowed he would find a way to get her an artificial leg. 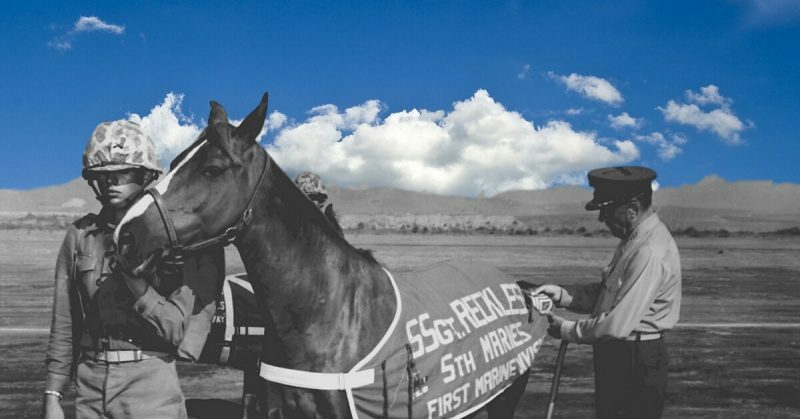 Soon after, Kim was at the track when Marines in need of a horse for carrying ammunition arrived. Lt. Eric Pederson needed a way to move guns and ammo without further burdening the backs of his soldiers. He so believed in this mission that he put up his own money – $250 – to do it. Kim was torn. His beloved Flame meant almost everything to him, but so did his sister. He very reluctantly sold his biggest dream and best friend to the Americans. 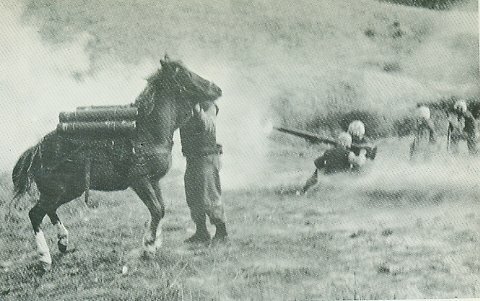 Renamed Reckless, the mare made a home with the “Reckless” Recoilless Rifle Platoon, Anti-tank Company, 5th Marine Regiment, 1st Marine Division. She slept with them, ate with them, and even drank beer and Coca-Cola with them. More importantly, she served with them. The Marines trained her to learn her supply routes – usually with just two trips – and going forward; she traveled them alone. She brought supplies and ammunition and carried the wounded on her trips back. She gave cover when necessary. This small mare, standing only 56 inches high, took on the weight of war and never faltered. Her rank was not a nickname – it was real. She was given the rank of corporal in 1953, sergeant in 1954, and staff sergeant in 1959. She served in combat for nine months. Luckily, Reckless had a great Marine trainer. Gunnery Sergeant Joseph Latham taught her to how to avoid entrapment and injury from barbed wire and how to duck and cover – both by lying down and by running for shelter whenever she heard the “incoming” warning. Reckless was not merely reckless; she was steadfast. During the Battle for The Outpost Vegas, she made 51 solo trips alone over one very long day. That day she carried nearly five tons of ammunition up a mountain – again – 51 times under heavy enemy fire at 500 rounds per minute. The soldiers revered her so much that whenever she made the journey through heavy fire, they sacrificed their own flak jackets to cover and protect her. Still, she was wounded twice – but she kept going. 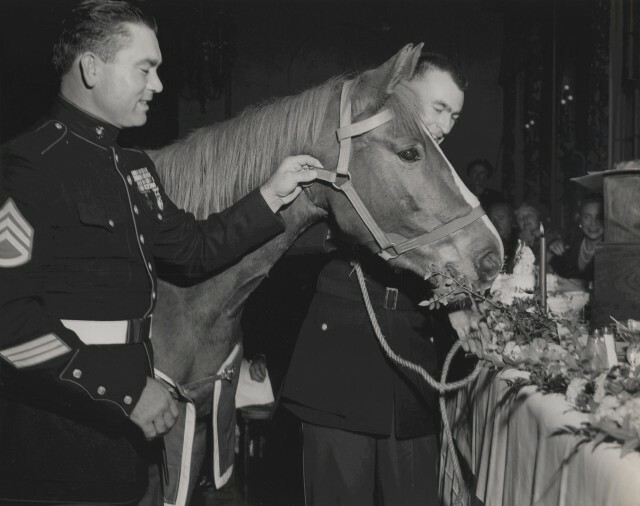 When combat ended, and Reckless was brought to the United States, she attended the Marine Corps Birthday Ball as the guest of honor. She rode the elevator to the ballroom dressed up in a dress blanket decorated with ribbons and insignia and ate cake and flowers. Reckless spent some time with Pedersen and his family before moving to Camp Pendleton where she gave birth to four foals in-between duty and a very few television appearances. Her last promotion to staff sergeant was a full official ceremony with a 19 gun salute and a 1700 man parade, officiated by Commandant Randolph M. Pate, who had been the first to promote her on the battlefield a few years prior. She retired from active duty with full military honors in 1960 with a Purple Heart, 3 Bronze Stars, and several other awards. In lieu of monetary compensation for her retirement, Marine documents list her pay as free quarters and feed. Kim’s Flame of the Morning and the Marine’s beloved Reckless was buried with full military honors at Camp Pendleton in 1968. In 2013, she was honored with a statue in Semper Fidelis Park that depicts her carrying ammunition and combat equipment. Through sentiment and reverence, the Marines kept a lock of her hair for nearly 50 years. It now rests in the base of the statue.